While most Alaska boroughs and census areas have lost jobs during the state’s economic downturn, some have gained. The Matanuska-Susitna Borough had the biggest job growth from 2015 to 2018, according to a new economic report from the Alaska Department of Labor and Workforce Development. The borough’s job count grew 3.4 percent — or 769 jobs — during that time, comparing the first three quarters of each year, 2015 to 2018. Most of that growth was in health care and social assistance jobs, the department found. The borough has also had strong population growth in recent years, adding 10,000 people from 2013 to 2018. That’s “a distinctly different pattern from the state as a whole, which had almost no population growth over that period,” the report said. Overall, Alaska has lost 12,700 jobs in this recession, which started in the last quarter of 2015. Job losses are slowing now, and the labor department projects that the state will have modest job growth in 2019. Anchorage, where 40 percent of the state population lives, lost 6,084 jobs from 2015 to 2018, the highest amount of any area. That factors out to a 3.9 percent decline. Of those Anchorage losses, the biggest decline was in the professional and business services sector, which includes attorneys, engineers, and architects. Anchorage jobs in that sector were down about 2,600 from the first three quarters of 2015 to the first three quarters of 2018, said Dan Robinson, chief of research and analysis at the state labor department. “Remember that those jobs are connected to both oil and gas activity and capital budget spending, so they got hit from two sides,” Robinson said in an email. After professional and business services, oil and gas was the next biggest loser in Anchorage with a drop of 1,300 jobs. Construction, retail trade, local government and state government followed. Anchorage did add 1,400 health care and social assistance jobs, Robinson said, and leisure and hospitality added about 200. The North Slope Borough lost 4,248 jobs from 2015 to 2018 — and those workers live all around the state. The Fairbanks North Star Borough lost 757 jobs, the Kenai Peninsula Borough lost 850, Kodiak Island Borough lost 583, and the City and Borough of Juneau lost 463 jobs. 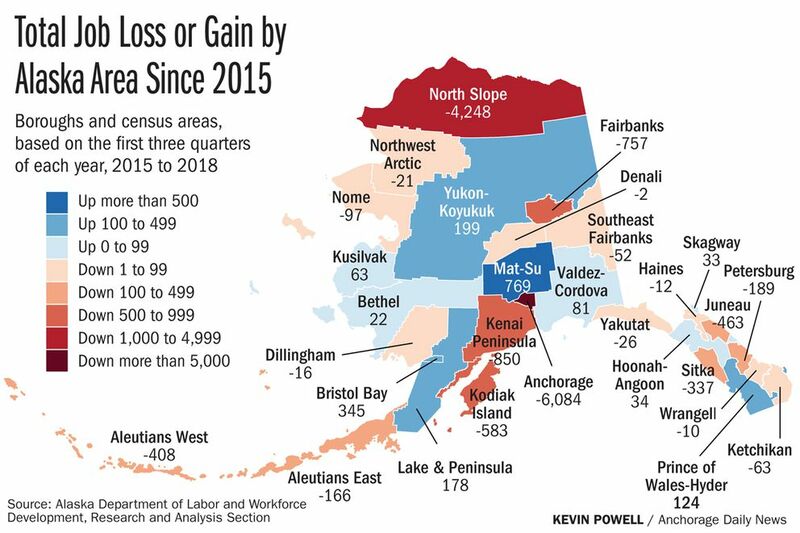 Along with the Mat-Su Borough, other gainers included the Yukon-Koyukuk Census Area, which added 199 jobs, the Bristol Bay Borough which added 345 jobs, and the Valdez-Cordova Census Area with 81 more jobs. Alaska’s recession has now stretched on for more than three years. A labor department study that looked at extended state job losses from 1961 to 2016 “identified 259 state-level recessions and determined that when a recession lingered beyond three years, it was usually due to structural shifts in a state’s economy.” Most of the time, states didn’t lose jobs for more than three years. After shedding thousands of jobs, Alaska’s oil and gas sector is expected to add a few hundred jobs this year. Last year was the sixth year in a row that more people moved out of Alaska than moved into the state. But that trend is driven more by fewer people arriving in Alaska than it is by more people leaving in droves.